the quality of being arrogant. I see a convergence of arrogance in the media, in Hollywood celebrities and from politicians. It’s always been there but now it appears, at least to me, to be an epidemic. I used to believe that the common sense of a majority of people would save us from a superfluity of ignorance and stupidity. As we all know, the first can be cured and the second cannot. I didn’t take into account the number of people who would bow down to the arrogance of the media and celebrities. I never believed that Americans would mistake the self-importance of these people as wisdom. As for those who worship at a politicians feet, I see no help for such stupidity. I suppose such a judgemental attitude makes me seem arrogant. But I don’t think I know everything about anything. In the vast scheme of things I know very little. I do know that those who claim to know so much, based on knowledge gained from a dishonest media and celebrities with the IQ of a bread-stick are arrogant when they seek to inform me of how ignorant I am. Far too many people now get their information from a “tweet” on Twitter. I know it’s difficult to believe that anyone could be that foolish and then argue some issue with a person who actually knows something about it. How amazing is it that people who know so little about so much are so willing to run their mouths and keyboards and prove their own ignorance? All while arrogantly insisting that they know more than the people that disagree with them. 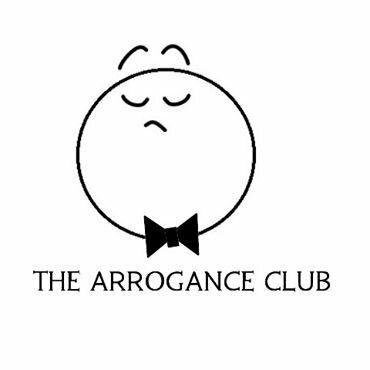 It was Wilfred Bion who said: ” Arrogance is a great obstruction to wisdom.” And so it is. If you think you know all the answers then how can you learn? When you pontificate without knowledge or facts you are not only being arrogant you are showing your ignorance. Those who look to fools for answers will end up equally foolish. Such fools think themselves wise. 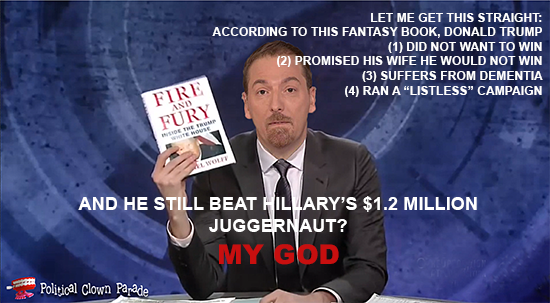 The big story this week was a book written by a guy known for exaggerating about a guy known for exaggerating with the main source being another guy known for exaggerating. And I’m not exaggerating. I have no idea what’s true and what’s not true in the new book Fire and Fury: Inside The Trump White House, and neither does anyone on cable television repeating its claims like they were a personal witness to the events described in it. But neither does the author, it seems. In the book’s prologue he wrote, “Sometimes I have let the players offer their versions, in turn allowing the reader to judge them. In other instances I have, through a consistency in the accounts and through sources I have come to trust, settled on a version of events I believe to be true. 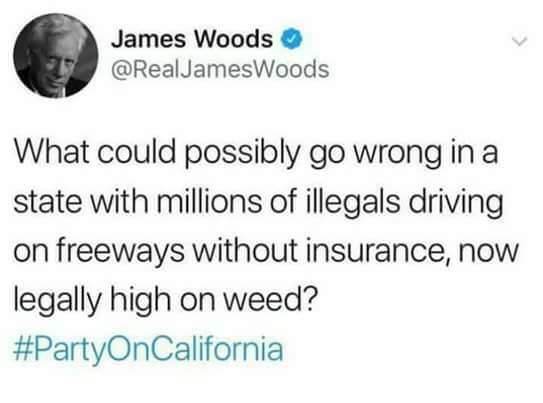 There is one celebrity who asks some reasonable questions. He’s also smart and well informed. How he ended up in Hollywood is beyond me. But then I don’t know everything. Yale psychiatrist who briefed Hill Dems wants to physically restrain President Trump, force him to submit to evaluation, declare him unfit for office. But she worries: ‘This really will look like a coup.’ You think? I find it amazing that the very people who call Trump a fascist are so willing to behave like fascists. To “professor” Brandy Lee I have a suggestion: “physician heal thyself”. It’s also amazing that the Trump detractors cannot see how often they are guilty of the behavior of which they accuse Trump. They go on a expletive laced rant to protest the crudity and lewdness of Donald Trump – how can anyone be that self-unaware? The media that protests the term fake news being applied to them responds with more fake news. They could save themselves hits to their credibility by simply doing a little investigating like real journalists should do. Here’s a radical thought, how about not making assumptions unless you know the whole story. Do these people listen to what they say? Do the people that watch them every Sunday morning hear the baloney that is being peddled as “news”? I just don’t get it. I honestly don’t. How about the arrogance, and stupidity, of a man who has been accused of sexual misconduct accusing the Trump children of being as vile as Saddam’s sons? Matthews compared President Donald Trump’s children to known child rapists, murderers, drug users, thieves, and anti-Semites on Tuesday while interviewing the author of the newly released and already debunked book on the Trump White House. While interviewing Michael Wolff about his book “Fire and Fury: Inside the Trump White House,” Matthews compared Trump’s children to Uday and Qusay Hussein. What kind of a man does that? What kind of a human being is so filled with his own self-importance that he thinks it’s okay to accuse people of being so vile when it simply isn’t true? This isn’t the first time that Matthews hyperbolic nonsense has debased the air-waves. He does it often. His arrogance is repulsive. What it says about those who still watch this cretin I don’t know. Nothing good I suspect. I do know that you are not apt to hear humility, modesty or honesty from the media, Hollywood or the Democrat Party. Today is another day when I suspect we will be bombarded with nonsense, lies and hyperbolic rhetoric from arrogant people. Another day when I will not watch the news on television. I simply don’t trust or believe them. I don’t like arrogant people. I especially don’t like arrogant people who have so little to be arrogant about. Have a good day. Ignore the idiots, love family and friends and try not to let it all get you down.